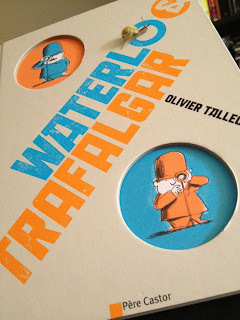 Waterloo & Trafalgar by Olivier Tallec is exactly the kind of picture book you read as a child and remember and love well into adulthood, and cherish if you are lucky enough to hang onto it. (I have to pause here and note a really great moment in motherhood for me: I asked my youngest son if we should give the last book he finished reading - Invisible Inkling: Dangerous Pumpkins - to his friend and he said, "No, I want to keep it and give it to my kids to read when I'm a grown-up." He reads, and not always grudgingly, so I was surprised and thrilled to hear him express that kind of sentiment about a book.) Tallec has published over 60 children's books in his native France and Waterloo & Trafalgar is his eighth released in the US by the wonderful Enchanted Lion Books, a publisher dedicated to bringing the best in foreign picture books to the our shores. Echoes of SPY vs SPY, the wordless comic strip from MAD Magazine and the series of cartoons from the 1960s, The Inspector, featuring Jacques Clouseau of Pink Panther fame, are evident in Waterloo & Trafalgar, although with significantly less violence. 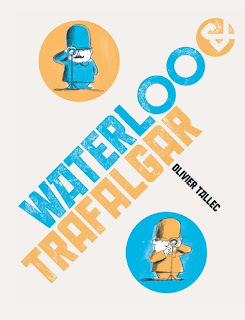 Waterloo & Trafalgar is a more whimsical, wordless tale of two little men living on opposite sides of a walled field keeping a wary eye on each other. 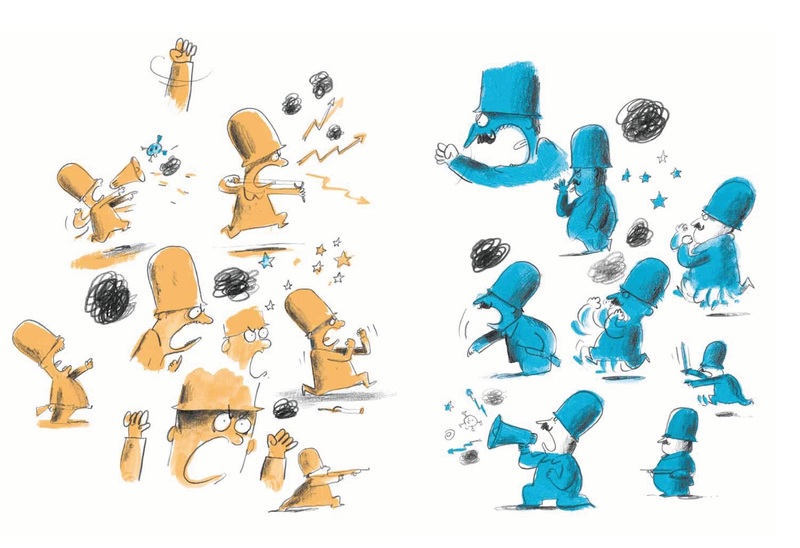 I think it's safe to say that the orange clad fellow is Trafalgar and the blue clad chap is Waterloo, or, England and France. 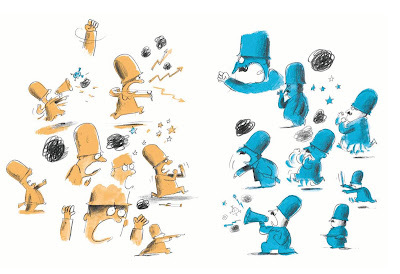 Orange and blue are the only colors used in Waterloo & Trafalgar, to great effect. I read Waterloo & Trafalgar and saw two guys keeping a wary eye on each other, although other reviews have noted that they are clearly guards or soldiers working a border. And, while this book is definitely a gentle, laugh-out-loud funny at times, anti-war polemic, I don't think it has to be read that way. 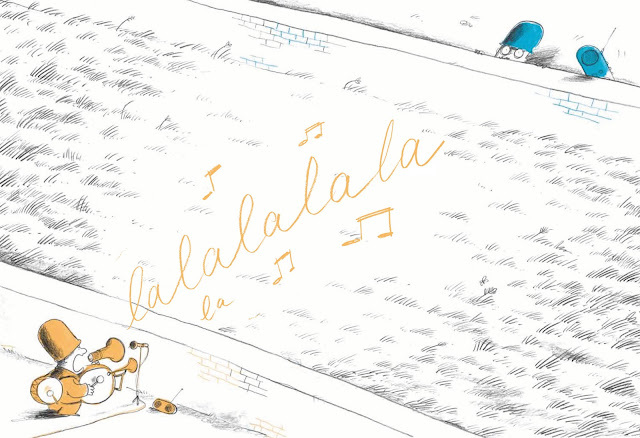 That's the beauty of a wordless book - interpret it however you want! The two chaps have telescopes and rifles, but they also have some of the comforts of home with them as they stand behind their walls. They garden, make tea on a hot plate, and hang their laundry on the line. 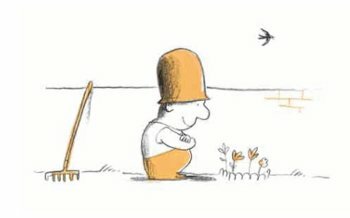 Orange Chap encounters a snail one day and makes a little obstacle course for him, enjoying his company until he moves on. 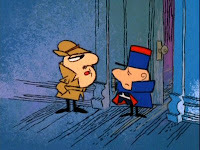 In the next scene, a bit of smoke is seen rising above Blue Chap's wall and we discover him roasting the snail for dinner. Orange Chap discovers this too, when the empty shell is tossed over the wall. 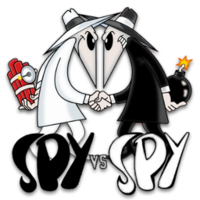 The two chaps almost come to blows over the snail, but they return behind their walls, a bit more tension in the air than before. 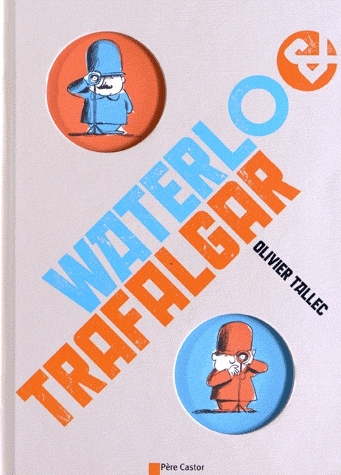 Die-cuts and divided pages add to the delight of Waterloo & Trafalgar, giving it an animated feel. The two go through their daily rituals and have more minor skirmishes until one day a bird lands on Orange Chap's wall and lays an egg. The chick that hatches from it is half-orange and half-blue and creates a final ruckus that leads to hugs. The last line of the Publishers Weekly review of Tallec's book is so great (just like the ending of Tallec's book is so brilliant) that I have to borrow it. The reviewer notes that, as the chaps become friends and the perspective pans out in the final illustration of Waterloo & Trafalgar "Tallec reveals, in more ways than one, that they're on the same side."